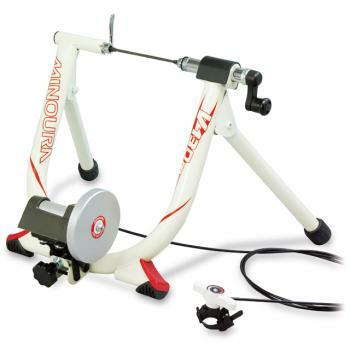 As part of the V Series of Minoura turbo trainers, the V130M is compatible with Minoura’s Live Training software. This software runs of Apple IOS mobile devices (iPhone 4 or above, iPod touch 4th gen or above, iPad 2 or above) and lets you track all kinds of stats such as power, cadence, and heart rate, as well as running various workout programs for an enhanced workout session. The V130M uses an advanced Magturbo brake, which is more powerful and quieter magnetic brake than the standard Magturbo brake found on the entry-level B60-D & B60-R. 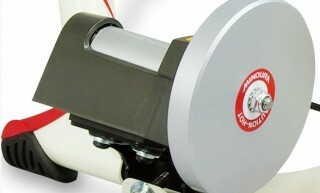 This more advanged brake uses a neodynamic magnet and offers a wide range of resistances, with a power output of 433 and 672 Watts at speeds of 40 km/h and 60 km/h respectively. 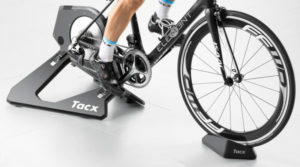 The Minoura V130M turbo trainer uses a virtual 1.5 kg flywheel and you can use a handlebar mounted resistance lever to choose from any one of 7 resistance levels. This allows for high and low speed resistance training.